My friend is Samoan and worked in HK as professional for 1.5 years but He finished his contract last March 17, 2019. Can He apply a holiday working visa Or working visa for him self since he wants to stay? Any advise or help would much be appreciated. Samoan (Western or US) nationals do not qualify for a working holiday visa. he cannot extend an employment visa without having an employer. When submitting the visa application do you need to submit your passport or will a copy be sufficient? Hi, How do you pay for the holiday working visa? and where do you post it to? Do you post it to the Embassy in Australia? Send it directly to ImmD Tower in Wanchai. I am applying for a Holiday Working Visa from the UK. Do you know how I can prove * You must hold medical and comprehensive hospitalisation and liability insurance to cover your time in the HKSAR? Has anyone used a company before? Yes – you buy a policy and include that in your application bundle. I am from the UK (currently residing in Australia) and have recently applied for a Working Holiday Visa – I meet all the criteria and have sent the relevant documents etc. I’ve seen contradicting information regarding ‘processing times’, and also whether a notification/ acknowledgement of application being received is sent to the applicant – I would love to track the progress of my application. Is this something you’re able to shed some light on? It will take c 3-4 weeks, sometimes a bit less time. I sent my application by post, and have received tracking confirmation that it was delivered over 1 week ago; however, I have not received an email or letter notification telling me that my application has been received or is currently being processed. Do you think this is something to worry about? No. You might even get the approval letter before you receive the receipt. Do I need to contain a outbound ticket (germany to Hong Kong) before applying? 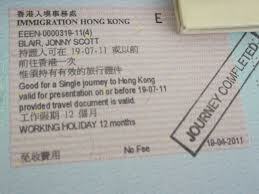 Is it an option at all to travel to hong kong (visa free) first and apply when I am in the city and stay for 1 year? Best to apply for your WHV before you travel to HK. What qualifies as “proof of acceptance to hold” medical insurance when applying for this visa? Will a written letter promising to hold insurance during the visa period do? Obviously I do not want to buy the insurance until I know the visa is approved. You need something more concrete – like a formal quote. However ImmD may or may not accept this. Suggest you buy a policy which you can settle in 12 monthly installments. Can you get a second working holiday visa? But is there any way of knowing when this starts for each year? Have I got more of a chance applying at the start of the year because thats when the doors open for the 1000people (UK) quota, or midway, later in the year? if WHV candidate is limited to maximum 3 months per employer in Hong Kong, is it possible to work longer if different company name but same group? Heard there are Groups with many companies within (probably with same directors or owners), can the candidate work in the Group for over 3 months after changing employer company name? You must work for separate legal entities. If they are owned by the same party that’s fine so long as the job is different each time. Hi, I am in Hong Kong at the minute and want to apply for the WH visa but I’m not sure if applying in person is allowed or if you have to be in your country of residence when you apply? Technically you should be in your country of residence when you apply however plenty of people are in HK when they apply and it doesn’t appear to be a preclusion if you are in Hong Kong on the date you submit your WHV application to ImmD. Good article and glad you referenced the use of my photo with a link to my site. Thanks Jonny. You’ll be sad to hear than Delaney’s in Wanchai is shutting down soon… sigh… there goes my favourite lunch place! TST Delaney’s is still going strong. Your article doesn’t mention UK. Does that mean uk citizens can’t get a working holiday visa?